Here’s a book trailer for When the Hero Comes Home, edited by Ed Greenwood and Gabrielle Harbowy, which includes my story “Brine Magic“. I missed posting this when it first came out. Enjoy! 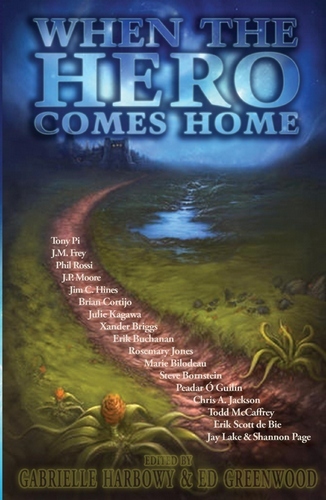 I also received a contributor’s copy of WHEN THE HERO COMES HOME in the mail. Awesome. This is the official cover for When the Hero Comes Home, edited by Gabrielle Harbowy and Ed Greenwood, which contains my story “Brine Magic“. It’s available now in Kindle and epub formats here. The paperback version will be out later this summer. Here’s the table of contents for WHEN THE HERO COMES HOME, co-edited by Ed Greenwood and Gabrielle Harbowy, available August 2011 from Dragon Moon Press.